History is important. It shows us the things we accomplished, the mistakes we made, and the people who influenced our lives. And it’s important to preserve our history and our connections to the past. We want to be remembered. So it’s no surprise that we are trying to hold on to pieces of the past. As early as 2010, Hawaii was vying to build President Barack Obama’s presidential library – even setting aside a $75 million plot of oceanfront property next to the University of Hawaii’s medical school. Last month, the University of Hawaii revealed that it wants to spend $16-$20 million (plus $2 million for site planning) to build a library to house the congressional papers of Senator Daniel Inouye. As of August 25, the center is projected to cost $25 million. This is in addition a partnership between the University of Hawaii at Manoa and the Library of Congress to digitize all of Senator Inouye’s congressional papers and produce an oral history project. Much as I love libraries and books, I would rather honor public service with living memorials. Think about the excitement of Duke’s OceanFest in Waikiki, honoring legendary waterman Duke Kahanamoku, with surfing contests, volleyball, soccer, paddleboard races, swimming races, and an expo. * Fund scholarships and internships. Encourage students and recent graduates with scholarships, internship stipends, or bonuses for working in under-served communities. This would promote public service, politics, and foreign affairs. * Create legal and accounting watchdog internships. Offer paid internship programs to identify duplicate, obsolete, and conflicting Hawaii laws and tax codes – and propose solutions. This would count as course credit for graduate students, promote government accountability, and help all constituents. * Create or expand a jobs training program. Help students and employees upgrade their skills in leadership, management, and entrepreneurship. This would create a more skilled workforce and hopefully lead to more profitable businesses and more jobs. * Build or repair a community recreation center. Design parks with the activities that our public leaders enjoy, such as bike parks, swimming pools, and hiking trails. This would help beautify Hawaii and build a stronger community, since so many of our parks and restrooms are in disrepair. * Invest in economic revitalization. Build a community health clinic, partner with a credit union to offer business loans and lines of credit, or offer low-cost legal and financial advice for small businesses. This would encourage people to take care of themselves and promote entrepreneurship. * Plant trees in the community. Dedicate trees along highways, in community parks, and on preservation and conservation lands. Neighborhood children could help plant the trees. This would beautify Hawaii, contribute to cleaner air, offer shade to pedestrians and park goers, and help with rainwater runoff. Libraries are just one way to honor public officials. What do you think is the best way to honor and commemorate our public leaders? How would you like to be remembered? I first learned about a Walk Score when I read “Walkable City: How Downtown Can Save America, One Step at a Time” (2012) by city planner and author Jeff Speck. A Walk Score is a number from 0 to 100 that measures a city’s walkability – and our ability to run errands without a car. Honolulu has a Walk Score of 62 (somewhat walkable), according to WalkScore.com. Downtown Honolulu, with a Walk Score of 88 (very walkable), is very pedestrian-friendly. Makakilo, with a Walk Score of 23 (car-dependent), is much less pedestrian-friendly. Just for comparison: Hilo, Hawaii has a Walk Score of 30 (car-dependent); Lihue, Kauai has a Walk Score of 78; and Lahaina, Maui has a Walk Score of 85 (very walkable). Speck promotes walkability not just for its health benefits, but also because we can save money and time by driving less (in terms of gas, parking, and traffic). We can have more discretionary income for local recreation and housing. Our government could spend less on roads and highways. According to Speck, a walkable city has to meet four main criteria: walkways must be useful, safe, comfortable, and interesting. “A true neighborhood has a center and an edge, and contains a wide variety of activities in close proximity within an armature of pedestrian-friendly streets and public spaces” (page 144). * Drivers: Teach a safer way to open the car door. Driving schools, instructors, and parents could teach new drivers to open car doors with their opposite hand, so they can check for bikes and pedestrians before exiting the car. We don’t need to wait for a change in the Hawaii driver’s manual. * Everyone: Plant more trees. Homeowners and businesses could plant more trees, which would offer pedestrians more shade and make walking and driving more interesting. In addition, trees cool the air, absorb rainwater and tailpipe emissions, provide UV protection, limit the effects of wind, slow cars down, and make us feel less stressful. Just remember to check with the city or your homeowners association. * Everyone: Ask for more 4-way stop signs. Instead of traffic signals at intersections, use 4-way stop signs to slow down traffic, make it safer for pedestrians, and save taxpayer money on maintenance and electricity. Speed tables, such as the one on Lanakila Avenue in Honolulu, are a good option for mid-street crosswalks. Roundabouts, such as the one at the intersection of Ala Napunani Street and Likini Street in Salt Lake, don’t seem to help pedestrians cross more safely, though they do seem to confuse drivers and slow down traffic. * Businesses: Offer special discounts to bus pass holders. Local stores, restaurants, and bars could offer special deals when someone shows their bus pass. This could help businesses that are near a bus route and encourage more foot traffic. While it would probably be more effective as a citywide campaign (TheBus on Oahu, Maui Bus on Maui, Kauai Bus on Kauai, Hele-On Bus on the Big Island), businesses don’t need to wait for an “official” program to offer discounts. * Businesses: Give parking cash-outs to employees. Businesses that offer free employee parking could offer their workers the option of trading that parking space for cash – or a bus pass. In Speck’s planning, parking cash-outs would be linked to the city’s agreement to reduce the businesses’ parking requirement. But businesses don’t need to wait for the city’s approval. * Businesses: Build shared parking lots. Like shopping malls, businesses could form a cooperative and pay in-lieu fees that help finance shared parking lots, instead of having dedicated parking lots for customers and employees. Converted parking lots could be converted into outdoor courtyards or sidewalk dining. This could create more foot traffic and increase sidewalk activity. For example, warehouse stores often have gigantic parking lots that are deserted once the store closes. Could they work out a shared parking lot agreement with nearby businesses? I don’t know what the parking requirements are for businesses, so I don’t know if the city needs to give permission or approval. * Developers: Hide parking garages. Developers can design building facades to hide parking garages and give pedestrians something nice to look at as they walk by. These parking garages would have flat parking areas at the building perimeter, tilted car ramps at the center, and high-ceiling commercial space on the ground floor adjacent to the sidewalk. Not only would this blend into the neighborhood, it would give developers the flexibility to convert the parking garage to offices or housing (the ramps could be converted into a courtyard). And it doesn’t require any changes to the building code. Do you walk or bike to work, to run errands, to exercise, or just for fun? What would encourage you to walk or bike more? Do you prefer living in an urban city, a suburb, or a rural community? Last month, Honolulu City Councilman Joey Manahan introduced Resolution 13-116, asking that the city study the feasibility of opening hygiene centers in Honolulu for the homeless. The nonprofit Urban Rest Stop in Seattle, Washington, which offers toilet, shower, and laundry services 24-hours a day, is held up as model to follow. I thought hygiene centers would be a good idea when I first read about it. But the more I thought about them, the more I questioned it. It’s a big investment in land, building, and staff, but the resolution is based entirely on one human services program in Seattle. When looking at legislation, there are three basic questions to ask: 1. Is it constitutional? On this issue, yes. The bigger questions are: 2. Can we afford it and 3. Does it solve the problem? * Can we afford it? According to a KITV news article, Manahan says that the Urban Rest Stop spends $600,000 a year for each of its facilities. It’s paid for by the US Department of Housing and Urban Development, the City, and private donors. I don’t think we can rely on the federal government for funding, and I don’t think the City can afford to run hygiene centers, in addition to shelters and other programs. * Does it solve the problem?Honolulu already operates 13 homeless shelter programs and numerous aid programs. Would the homeless people who currently avoid shelters use a hygiene center? Would people want to use public parks and playgrounds if a hygiene center is on the grounds? Would enough people use the center to justify the 24-hour staffing that we need to prevent vandalism and illegal activity? While a hygiene center would help homeless people who have a job or who are seriously looking for a job, it would not reduce the number of tents and shopping carts on the streets. Homeless people don’t have easy and welcome access to restrooms and showers. * Drive mobile hygiene trucks. Instead of building and staffing a permanent hygiene center, we could test this concept with a mobile hygiene truck. Okay, it’s not an existing service, but the idea works for food (Meals on Wheels) and books (Hawaii Bookmobile). And social service workers already drive out to meet clients. This would offer an additional service, and the mobile staff can help them get into a shelter. Could we convert old buses or container boxes? Is the water hookup even possible? * Open the YMCA and Hawaii hostels for special hours. Can the nonprofit YMCA have special open-house hours for homeless people to use the showers and restrooms, even if they are not living in YMCA housing? Could the city contract with hostels for similar open house hours? Homeless people are disconnected from the community. * Get family members and friends involved. Can we start a program to get family members, childhood friends, and former co-workers to help? These relatives and acquaintances could work with a social worker get homeless people into shelters and take turns keeping in touch with them. * Recruit churches, civic groups, and nonprofits. Can churches, civic groups, and nonprofit organizations adopt a homeless person living in their neighborhood? Can we create a Big Brothers, Big Sisters type of mentor-assistance program? Homeless people do not have a safe place to store their belongings. * Build storage lockers. Can we install storage lockers in public places, such as police stations, staffed public parks, the State Capitol building grounds, and municipal buildings? Can we ask businesses to report the theft of their shopping carts? Do you think that hygiene centers would be an effective way to help the homeless? Are there better ways to aid the homeless? What types of assistance programs should be a priority in Hawaii? It’s back-to-school time, and schedules will be even more hectic with school, practice, get-togethers, and the holidays. So it’s a good time to plan to get more done. Your “frog” is your biggest, most important task, the one that you are most likely to procrastinate on and the one that can have the greatest positive impact on your life. That’s the inspiration behind a motivational book called “Eat That Frog! 21 Great Ways to Stop Procrastinating and Get More Done in Less Time [Second Edition]” (2007) by Brian Tracy. He shares the 21 most powerful principles to manage your time and get things done. 2. If you have to eat a live frog at all, do it quickly. 3. Get rid of the tadpoles and focus on the frogs. Step 1. Set the table. Write down your goals, focus on one, and then set milestones and deadlines. Kids: what do you want to learn or accomplish this year? Do you want to learn another language, play in a musical show, dance in a hula competition, perform in a karate demonstration, earn enough money to buy a tablet computer? What things do you need to do to reach your goal? Adults: what do you want to accomplish this year? Do you want to earn a promotion, find a job that better fits you, coach a sports team, run a half-marathon, start a small business? What things do you need to do to reach your goal? Step 2. Plate it up: the ABCDE method. Write a list of everything you have to do and prioritize it with A (must do), B (should do), C (nice to do), D (delegate it), and E (eliminate it). Kids: what school assignments, activities, and hobbies do you absolutely need to do? Are there hobbies you can give up so that you can do something you enjoy more? Are you doing too many extracurricular activities, and want to focus on just one or two? Can you cut down on some activities, like watching TV or playing video games or surfing the web, in order to take more time to reach your goals? Adults: what office responsibilities, volunteer jobs, even household chores do you absolutely need to do? What can you delegate (maybe someone else would be a better fit or wants the chance to take on more responsibility)? Can you cut down on some activities, like driving the kids to school (try to set up carpooling with other parents) or cutting the lawn (maybe there’s a neighborhood kid who is willing to work) or having a family get-together (make it a potluck). Step 3. Take small bites. Break down your goal into small steps, and work on them every day. Give each task 100% of your attention. Commit to finishing the bite. Kids: when you’re working on your goal, are you thinking about homework, a new game, or a party this weekend – or are you focused on your task at hand? Can you create a space where you can plan, study, practice, or rehearse without distractions? Adults: when you’re working on your goal, are you thinking about chores, a performance review, an episode of the latest TV show? Can you set aside “frog time” to work on your goal? Step 4. Always eat dessert. Overworking, or trying to do too much, can mean underproducing, or doing a mediocre job. So work at your own pace, get enough sleep, take days off, and guard your physical health. Kids: what sports, activities, and hobbies help you recharge? Is it reading, playing video games, going skateboarding, swimming, listening to music, talking with your friends? Adults: what helps you relax and recharge? Is it playing basketball, watching sports or a movie, having a manicure or spa day, going out on a date night? What frogs (goals or projects) are you putting off eating? How do you keep on top of your schedule? 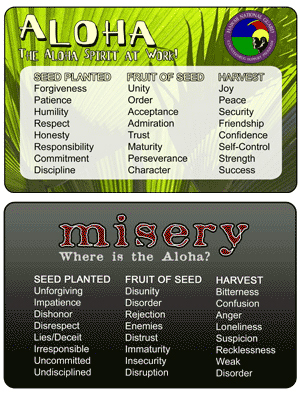 “Aloha” compiled by Anolia Offrecio Facun et al. Aloha is… feeling like part of a family, even amongst strangers you may never meet again… a way of life, welcoming others into our hearts… love and respect for life… putting service before self… doing what is right even when nobody is looking… God’s message… coming together for the greater good… taking individual responsibility to create and bring peace with our neighbors, and care for everyone. 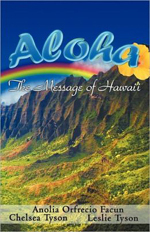 “Aloha: The Message of Hawaii” (2012) compiled by author Anolia Offrecio Facun and the mother-daughter team of Chelsea and Leslie Tyson is a thoughtful collection of personal stories, anecdotes, advice, and affirmations of God. The essays help visitors and residents alike appreciate Hawaii and share the meaning of aloha, written by local writers, many of whom chose to make Hawaii their home. There are short bios and black-and-white photos of most of the contributors, though some of the bios read more like resumes. The book ends with Hawaiian proverbs and sayings, and a short Hawaiian glossary. I would have liked to see some photographs and artwork to show aloha and engage our vision. * “TheBus has Aloha” by Nathan of TheBus taught me that you can bring aloha to your job. Nathan shared the joy of helping people visit new places and return home again and taking care of passengers. “The people they pick up are probably their co-workers, aunty or uncle or mother or father… We are all family, so we gotta take care of them” (pages 38-39). * “The Law and Spirit of Aloha” by Brant Sugai taught me that we can create laws and run businesses based on aloha. 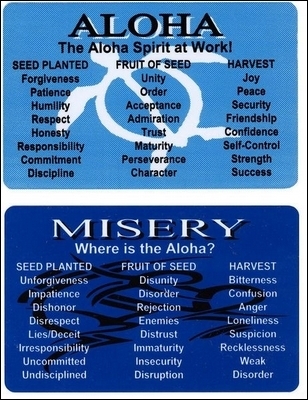 It starts by incorporating character education in schools and sharing the Aloha Card, which identifies behaviors, consequences, and their emotional harvests. * “A Bowl of Aloha” by Teresa Shuptrine taught me that a daily prayer, a simple kindness (sharing what you have, without waiting for a special occasion), and beautiful gardenia flowers can have a positive impact. What does aloha mean to you? How do you live aloha in your daily life? You are currently browsing the Better Hawaii weblog archives for August 2013.